The following post was first published in the great blog The Conversation – a not-for-profit initiative which shares knowledge from universities with a global public audience. It is reproduced here under their Creative Commons licence. Team Macron is ready to talk. You pick the language. 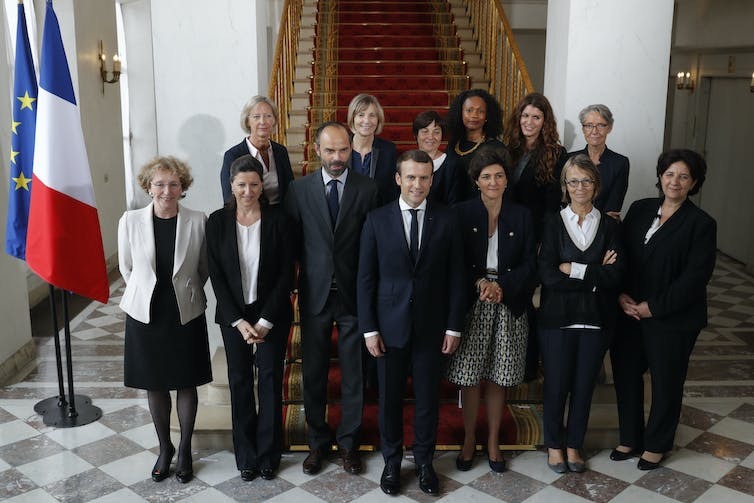 One of the most striking features of the recent French presidential elections and the subsequent nomination of a new prime minister and his cabinet has been the attention paid by the French media to the linguistic competences of the nation’s politicians. Certainly one of the best jokes to do the rounds after Emmanuel Macron was elected was that France now has a leader who speaks better English than the American president. Macron does indeed speak English fluently and has even given a number of interviews in English with the British media. This hasn’t always gone down well in France, where a stout defence of the global status of French has long been the political norm. When Macron gave a speech in English at the Humboldt University in Berlin in January 2017, Marine le Pen was quick to criticise what she saw as a lack of linguistic patriotism. But for others, Macron’s command of English is a sign that although he is very much a product of France’s elite educational institutions (and is widely admired for the elegance of his French) he is also prepared to be a citizen of the world. The nomination of Édouard Philippe as prime minister only reinforces the sense that Macron’s presidency is one marked by an impressive degree of linguistic competence. Here, however, we begin to see another world unfolding. Philippe was partly raised in Germany, where his father was the director of the Lycée Français in Bonn. He speaks German fluently, as does defence minister, Sylvie Goulard. The British press has tended to suggest that Goulard’s fluency in English may be an advantage in the forthcoming Brexit negotiations, but it’s really her skills as a German speaker that give the clearest clue to the political priorities of the Macron administration. Bruno Le Maire is another German speaker and, in his role as finance minister, embodies the close ties that bind Paris and Berlin. Macron’s foreign policy adviser, Philippe Étienne, is another link in the Franco-German chain. French ambassador to Berlin between 2014 and 2017, he is known as a Germanophile. Before being recalled to the Élysée, he was about to take up the role of ambassador to Moscow. As a former ambassador to Belgrade, he brings a knowledge of Slavonic languages to Macron’s polyglot world. Meanwhile, the politicians on the other side of the Brexit negotiating table are hardly celebrated for their linguistic capabilities. Nick Clegg is known for his ability to speak various languages but during his time as deputy prime minister his skills were rarely praised in the press. In fact, he was often seen as one of “them” rather than a crucial point of contact between the UK and its continental neighbours. At a time when Jean Claude Juncker has suggested that English is losing its prestige as a working language within the EU, a command of a range of foreign languages seems ever more urgent. But linguistic competence is only part of the story. After all, high-level negotiations rarely rely on the linguistic savoir faire of the politicians involved, but on the work of highly skilled professional translators, interpreters and diplomats who are trained to spot, understand and render every nuance. Where a thorough command of a language does help is when it comes to questions of cultural understanding. The linguistic skills of Macron’s ministers attest to their ability to empathise with their interlocutors and to understand their cultural, historical and social hinterland. The number of fluent speakers of German in the French government ought to give the British government cause for anxiety. There is, after all, the real risk that Brexit talks will descend into a dialogue des sourds precisely because of linguistic and cultural misunderstandings. One of the reasons behind Macron’s victory was his call to put aside political divisions between left and right. It’s a lesson with linguistic resonances too. When it comes to Brexit, one way to avoid falling into antagonistic camps of “us” and “them” might surely be to embrace multilingual identities. Britain may not be able to have both “le beurre” and “l’argent du beurre”, or indeed have its cake and eat it, but a truly global Britain demands that we speak and listen in as many languages as we can.